Lodging costs account for approximately 26% of total travel expenditures for domestic trips. For construction administrators, travel coordinators, and office/project managers this comes as no surprise. Managing travel is a part of your day-to-day hassles. But the hard truth is, you’re probably paying far too much for it. Here are the 5 reasons why your crew’s hotels are costing you more than you think, and how to stop overspending. Unless you have a deeply negotiated agreement with each of your hotel chains, you’re not getting the best rate on your hotel rooms. However, that’s not the only reason you’re not getting the lowest price. For example, you’ve likely tried an online booking website that advertised a great room rate, but when you got the actual bill it was full of surprise charges and service fees. Which forces you to pay much more than you bargained for. You could also be getting a subpar discount because you’re confined to a lodging discount program that has a limited number of in-network hotels. If you’re looking for long-term stays, it can be even more challenging to get the best price. Whatever the case may be, to maximize your project profit and increase your chances of winning bids, you need to reduce as much cost as you can. The problem is, you don’t have the time to call each hotel and negotiate a discounted agreement. 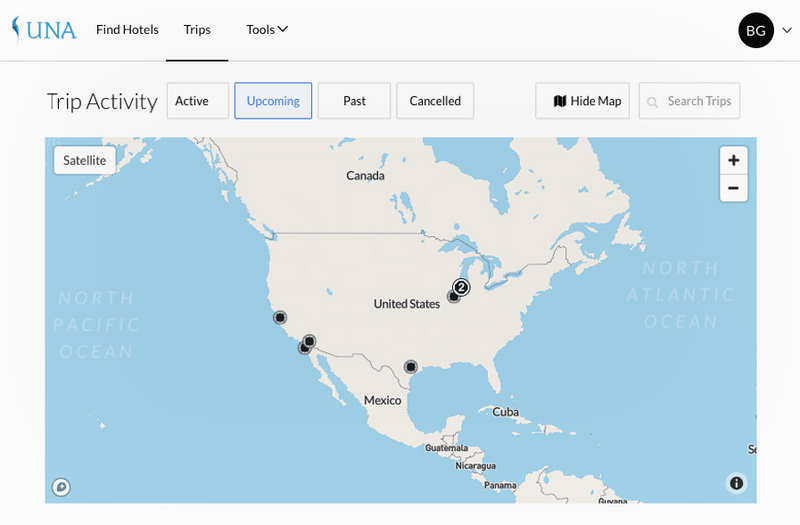 How to fix: UNA’s free hotel booking platform helps you find the best deal in minutes. Our rates are an average of 26% below list, and the price you see is the price you get. We help you reduce your travel spend, and gain access to over 250,000 discounted hotels, and you won’t have to worry about negotiating agreements. You know the scenario. You get a last-minute request asking you to book hotel rooms for dozens of people. First, you scour multiple travel websites and call several hotels to make sure you’ve gotten the best rate possible. Once you’ve finally chosen a hotel, you realize they don’t have enough rooms, and your crew will need to be split up. Then, when your crew is actually on the trip, you get a call – you forgot to issue a credit card authorization form, and because they don’t have the booking credit card with them, they can’t check in. Once your team returns, you realize there was an incorrect billing charge. So you find yourself back on the phone, wasting time trying to dispute the discrepancies. Sound familiar? A manual travel booking process is a huge liability. Because the more time and energy required, the higher the project cost, and the smaller the profit. 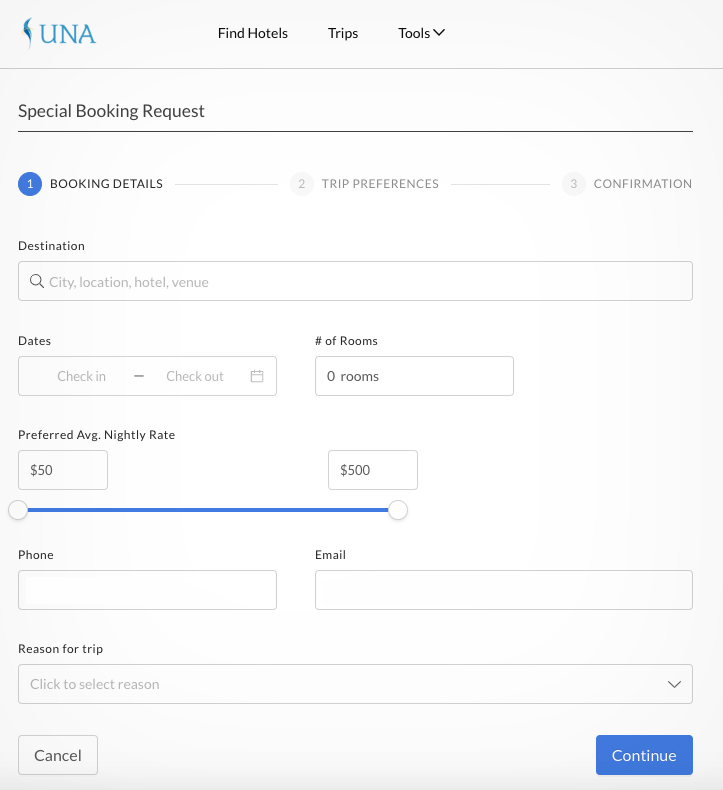 How to fix: UNA’s hotel booking solution helps you find the best rates, including affordable long-term options, quickly. Book up to 8 rooms at a time, or for large groups simply submit a group booking request for your group, and we’ll do it for you. You can even set up painless prepayment and direct billing options. The expense tracking also allows you to check trips and charges anytime. Contractors often underestimate direct costs or don't address them at all. That's one reason the average margin on an electrical contracting job is only 2%. Ignoring or forgetting these expenses can have a serious impact on your bottom line. 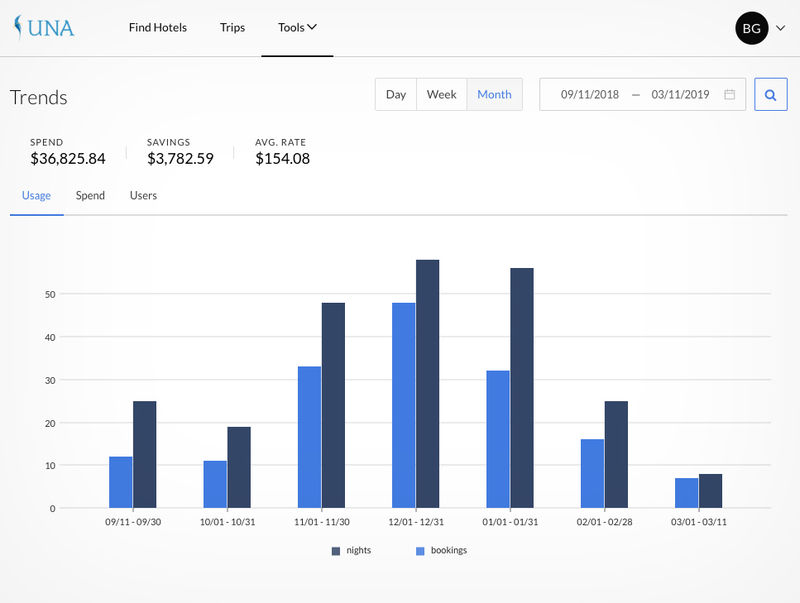 How to fix: what makes UNA’s hotel solution unique, is that you get price transparency on the total cost of your hotel rooms up front. As well as accurate expense evaluations after the trips are over. So you can see how much your team spends on each trip to each location. Which helps you determine what your RFP bid should be, and how much travel overhead to expect. The final way to waste time and money on your crew’s travel is by putting up with terrible customer service. Whether it’s a missing reservation, fraudulent charge, or poor service, giving your crews help when they need it, can be a challenge. Most hotel booking platforms have limited customer support hours, and you can’t personally be available 24/7 either. How to fix: when you book with UNA’s free hotel platform, we work directly with the hotels for you. Whatever the issue is, you can expect 24/7/365 access to US-based customer service, and a real person will answer the phone when you call. Yes, our platform really is free; there are no membership fees, hidden costs, or volume requirements. If you want to reduce your travel spend, or you just want a few hours in the day back, UNA can help. Learn more here or request a demo below.